Are you looking for curriculum for your high schooler for next year? Around this time, I was always looking into curriculum options for my teen, and exploring around for new ideas was one of my most favorite times in our homeschooling. 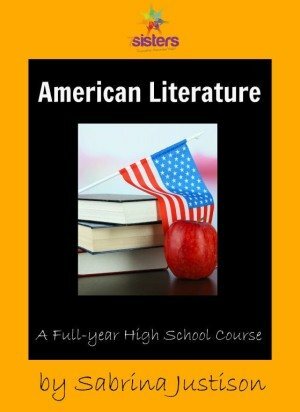 I recently found a new source for high school English courses that I like. These courses are actually made by homeschoolers. Have you seen the offerings at the 7 Sisters? This site is hosted by a group of veteran homeschool moms who all have homeschooled their teens through high school. They offer a large variety of high school curriculum based on their many years of experience. Let’s take a look at American Literature by 7 Sisters. I love 7 Sisters’ approach to literature. They offer many English courses, including American Literature. Today I’d like to share their American Literature course with you. The best part about it is that these courses avoid any busywork. Now that is how it should be! Students read one book a month and then work through the corresponding study guide. There is also a table to refer to, that helps you to adjust the course so that students can earn extra advanced or honors credit if desired. Each title has a study guide to go along with it, with critical thinking questions to help your teen learn literary analysis. Now, teaching the concepts of literary analysis can be a little daunting. I love how 7 Sisters teaches it. They avoid attempting to examine all the literary devices at the same time. Instead, each study guide focuses on only two or three literary elements. Great idea! By working through this course, your student will develop a good understanding of all of the aspects of literary analysis, one step at a time! That is great prep for later work in college, if that is where your teen is headed. I love how they offer an answer key also. This can be so helpful for guiding your literature discussions, at home , or at co-op. Talking about the books together…what a great way to reinforce literary analysis and build critical thinking skills in your teen. 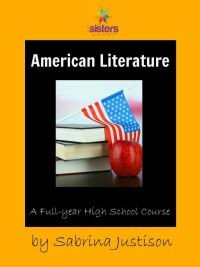 If you are looking for a great resource for American Literature or any of their other courses mentioned above, click the American Literature image, below or click here. Betsy is mom to her college junior whom she homeschooled since preschool. She blogs at BJ’s Homeschool about the early years, high school and college, and is the author of “Homeschooling High School with College in Mind“. She offers free homeschool help through messages at BJ’s Consulting. Do you have any guides for British Literature?